This hardworking police officer is being hailed for protecting, serving, and pushing his community when the need arises – even under a devastatingly hot sun. 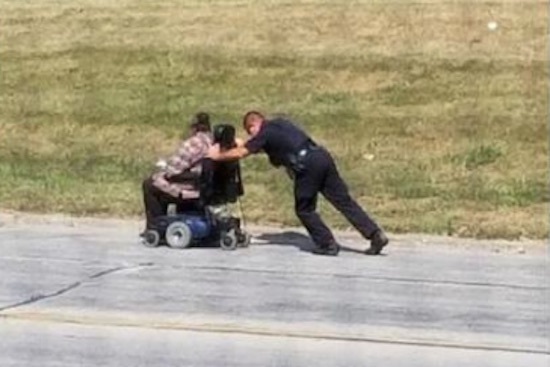 A pedestrian in Rock Island, Illinois snapped a photo of Officer Tyson Nichols from the Rock Island Police Department pushing an elderly citizen in a broken electronic wheelchair uphill in the heat. Nichols later revealed that the senior had been on her way to a doctor’s appointment when she got the wrong bus, became stranded, and her wheelchair stopped working. The good Samaritan cop contacted Metro Bus and asked if they could help safely transport the woman to her appointment. He then pushed the senior’s wheelchair to a shady spot up 31st Street and made sure that she was properly taken care of before departing. While Nichols did not realize that he was secretly being photographed, he later said he was happy to discover that a citizen would appreciate the compassionate work he was doing. “It kinda comes naturally with the territory as a police officer, you naturally, instinctively do things that you’re supposed to be doing,” Nichols told WQAD.